ForestPlanet is glad to be partnering with DC-area Jetties sandwich shops for the month of July. 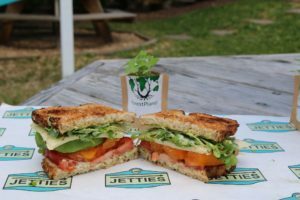 Jetties will plant one tree with ForestPlanet for each ‘Summer House‘ sandwich sold, either in any of their six area locations or via their exclusive delivery partner DoorDash. The Summer House is made from heirloom tomatoes, sliced avocado, sprouts, pepper jack cheese, celery salt and basil mayo on toasted multigrain…sounds healthy! DoorDash is also offering free delivery with the promo code ‘FORESTPLANET’ from July 1 to 31 for orders of $15 or more from any Jettie’s location. ForestPlanet is a registered 501(c)3 organization committed to supporting high-volume, low cost-per-tree reforestation efforts around the world. We help plant trees in regions where they have the greatest positive impact on the soil, the environment and communities in peril. Your generous donation is greatly appreciated. For an example of the type of work that ForestPlanet supports, please check out this recent article on Blue Carbon and how trees play a crucial role in revitalizing soil while reducing atmospheric carbon.